This week’s Thursday Thirteen is about things that are gross! 1. Not flushing the toilet. Nuff said! 2. Leaving cans, uneaten food, beverages, cups, bowls, and utensils in the bedrooms and in the car. 3. Leaving previously-used bath towels (or clean clothes) on a filthy bedroom floor that hasn’t been vacuumed in a month and using the towels or clothes again. 4. When a female takes a bath, shaves her legs for the first time in a week, and doesn’t wash out the tub for the next person leaving dirt and hair for someone else to clean. Yuk! 5. When someone takes off their underwear and jeans in one motion leaving the items stuck together inside out in the laundry hamper!!!!!!!!!! It grosses me out. 6. The smell of a locker that has held uneaten lunches for two or three weeks. We had a student have to clean one of these today. 7. This website called Bloody Disgusting. It is! 8. 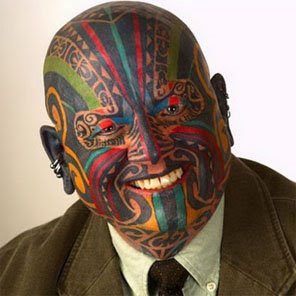 This photo of a man’s tattooed face. you are barefooted (even when you’re not) but especially when you are. 11. Snakes. Doesn't matter what kind. 12. The smell of spoiled milk that has been spilled on a rug or carpet and left unattended to for days. 13. The smell of a rat or squirrel that dies within the walls of your home. Good grief, I think you know my family! Yup, I agree. Especially with the one about the laundry. How hard is it to remove your pants, and then your underwear? Why is the man in that photo grinning? He looks utterly repulsive. And it's his own fault. I think tattoos are repulsive, no matter how small. I just don't like them. They are GROSS! I agree with you except for the tatooed guy. I think he's interesting but I wouldn't want to do that to myself. LOL! Happy TT. Must agree with you on most of them. Truly gross. Ewwwwwwwwwwwwww, #8!!! Is that for real? My 13 is a gross group of funny advertisements I made up for fun, and using this week's 'gross' theme for T-13. Hope you can stop by. Did you sneak in here to write some of these things? I went a different way with the theme, but am done with the theme weeks, I prefer to be creative on my own. Disgusting...the list...not your blog...love your blog, but think most items on the list you compiled are disgusting too! Lots of gross things around you... that's not giving us TMI, is it? Seriously. I couldn't resist the tease. The tattooed guy isn't gross -- YET. But you know he won't use sunscreen and will be all faded and green in a matter of time and THEN he'll be amazingly, revoltingly gross. What a thing to look forward to. Great list! I'm happy to see someone else followed the theme. Come on over and check out my gross. The pants thing with the underwear really gets me! I will not clean them till the owner seperates them! I have 4 boys and the toilet thing is right up there in the 'gross' numbers. Great TT and Happy TT. Thanks for visiting my TT. That's quite the list of disgusting things. Great TT! Gee Diane, It is SOOO apparent from this list that you've Got KiDS! And they are JUST like My gross kids over here! You may want to add the word 'sweaty' to #5! My son does that when he has been sweating and HE is too damn lazy to inside out the damp musty messy jeans with underwear permanently sealed to them. I wasn't going to do a TT this week, but YOu've inspired me girlfriend. Oh for sure that's gross!!! You got all those down pat!!! Ewwwie!